Any breastfeeding mother needs to be mindful of anything she uses that could pass through her milk to her baby, and it's natural to wonder if that means thyroid medications, too. While the only way to be certain about the safety of taking any medication while nursing is to discuss it with your doctor, it's generally considered that drugs used to treat hypothyroidism and hyperthyroidism are OK to take when used as directed—which may involve some modification to your current regimen. The type of thyroid disease you have, the specific medication you take, and perhaps the dosage should all be considered by your doctor. Undertreated hypothyroidism and hyperthyroidism can have consequences, both to your health and your breastfeeding efforts, so it's important to manage your condition in a way that's both effective for you and safe for your nursing child. While there are definitely medications that are ill-advised for nursing mothers, thyroid hormone replacement drugs used to treat an underactive thyroid (hypothyroidism), including Hashimoto's disease, are exceptions. Stopping your hypothyroidism medication may cause your thyroid levels to drop, prompting you to experience symptoms of your condition. Even taking a lower dose (without your doctor's guidance) could affect your symptoms. If the idea of taking one of these while nursing makes you uncomfortable, it may be helpful to know that hormone replacement medications are the same as the natural thyroid hormones produced in the body. What's more, as long as you stick to the prescribed dosage for you—that is, the amount that will keep your thyroid hormones at a normal level—only very small quantities of the drug will pass into your breast milk. The amount will not be enough to have an adverse effect on your baby. Equally important, adequate thyroid hormone is necessary for normal lactation and for maintaining a sufficient supply of breastmilk. In fact, without your thyroid medication, you may not be able to breastfeed. It's entirely possible to take too much thyroid replacement medication, which could bring on symptoms of hyperthyroidism. Again, make sure you're taking the exact dose prescribed by your doctor. Note, too, that natural desiccated thyroid hormone (often prescribed by alternative medicine practitioners and sold under names such as Armour Thyroid and Nature-Throid) are not recommended for women of childbearing age. If you take one of these, talk to your doctor about switching your medication. Your hormone levels may fluctuate during and after pregnancy. This makes it possible to develop hypothyroidism for the first time or, if you've been diagnosed and effectively managing your condition, to experience changes in hormone levels that lead to symptoms. The medications used to treat hyperthyroidism, as well as the autoimmune condition Graves' disease, are designed to lower above-normal levels of thyroid hormone. For some time, women taking so-called antithyroid drugs— propylthiouracil (often referred to as PTU), Tapazole (methimazole), and, in Europe, carbimazole (which converts to methimazole in the body)—were discouraged from breastfeeding. The concern was that the medication would pass through breastmilk and suppress the baby's thyroid gland or cause an enlargement of the gland known as goiter. In recent years, however, research has determined that in general, antithyroid drugs taken by women who are breastfeeding aren't likely to harm their infants or to affect the babies' thyroid or physical or intellectual development. There are some precautions, however. However, because propylthiouracil is linked to a small risk of liver damage, the researchers advise that it should only be used in special cases and for very short periods of time. What's right for you, of course, should be taken up with your doctor. 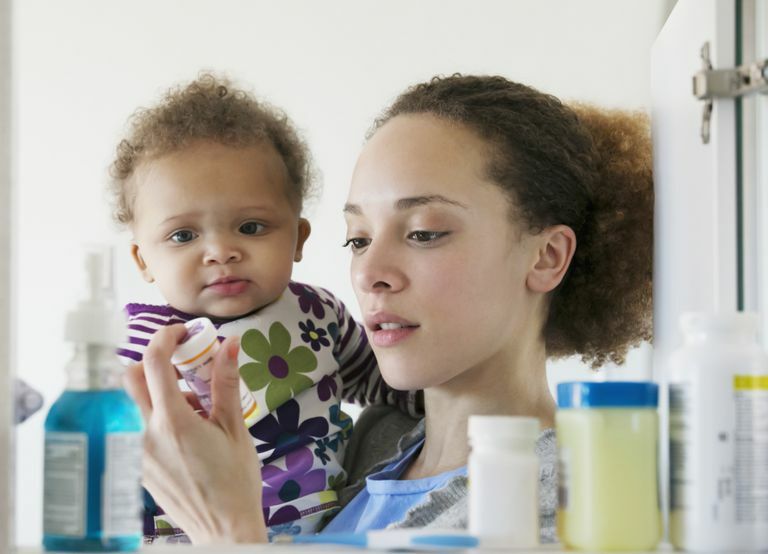 If you have thyroid disease that you take medication for, in all likelihood it won't harm your baby and it's critical for your health and perhaps even your ability to breastfeed. Just to be safe, it's advisable to nurse your little one before you pop your pill. This way the drug will have time to be processed by your body before you produce milk for the next feeding, minimizing the amount available to pass along to your child. In addition, it will be important that your thyroid hormone levels and those of your baby are monitored regularly during the time you breastfeed.